Farm Girl Veggie Bowls from the Dishing up the Dirt Cookbook! Pinch me!!! The Dishing up the Dirt cookbook is out in the world today. I’m over the moon and cannot wait for you all to get your hands on your own copy. I really hope the book makes you proud. And if you feel inclined, I’d be forever grateful if you left reviews on amazon. They don’t even have to be recipe reviews (but those are obviously great too!) there’s a farming love story throughout and beautiful photos to boot. I’m so excited for you all to see it and review it if possible. Thank you from the bottom of my heart! Before I get to this recipe I wanted to remind everyone that my local book signing is this Sunday (March 19th) at Springhouse Cellar in Hood River from 3-5pm. There will be live music, beer, wine, and snacks. I’ll be signing books and we’ll also be showing the cookbook trailer on a big screen! Following the trailer there will be a short Q&A and then back to hanging out and clinking glasses! It’s open to the public so bring along all of your family and friends. It’s kiddo friendly too! In celebration of my official publication day I wanted to share an exclusive recipe from the DUTD cookbook. These Farm Girl Veggie Bowls are simple, delicious and a great dish to whip up in the late winter/early spring. Serve with a glass of crisp white wine, good friends and hopefully a copy of your very own Dishing up the Dirt book so you can start bookmarking more recipes to make after this one! Cheers from an overly excited farm girl! Prepare the veggie bowl: Preheat the oven to 425F. Prepare the the quinoa according to package directions and set aside. 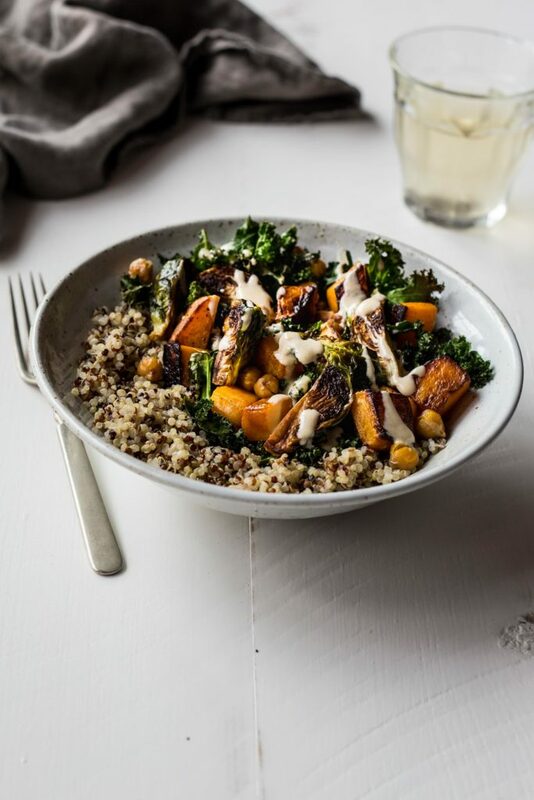 Place the butternut squash, Brussels sprouts, and chickpeas in a large bowl. Drizzle them with 1 tablespoon of the olive oil and toss until coated. Spread the veggies on a large rimmed baking sheet. Bake in the oven until the veggies are lightly browned and the butternut squash is tender. About 18-20 minutes. Toss the vegetables halfway through cooking. Place the kale in a large bowl and toss with the the remaining 1 tablespoon of oil. Add the kale to a baking sheet and put it in the oven for 5-7 minutes or until the leaves crisp up a bit. While the veggies roast, make the dressing. Add all of the dressing ingredients, along with 1/4 cup of water, to a small bowl and whisk until smooth, or use an immersion blender or food processor. Taste and adjust the seasonings if desired. Divide the quinoa between four bowls and top each bowl with an equal portion of the veggies. Drizzle with the dressing and serve. I have been cooking your tasty recipes for a couple of years and have shared many with friends and family. I am so excited to receive your cookbook, which I purchased online from Wacoma Bookstorel (even though I live miles away). My husband really appreciates your creative recipes and has been known to whip up a few of them himself. Love it! Thanks Andrea you help keep life fun, healthy and delicious! Amazon has just delivered my copy this morning!!! The book is so beautiful and I can’t wait to start using it. Such a hard choice what to cook first! I think I will have to make this today! Yum. I’m hoping to make it to the book signing on Sunday too! Congrats! Your passion pops out of the page! My new cookbook is in transit, arriving today. 🙂 I look forward to filling my kitchen with tempting aromas and my family with your delicious recipes!! So proud of you + happy for you and Taylor! Congrats, lady! It’s a beaut. The big day is HERE! Congrats, congrats, congrats! xoxo! And mine was at my doorstep today in the middle of our blizzard. Yippeee! Gotta go — lots to read…. Can’t wait to see you on Sunday! Will you have books available or should I pick one up ahead of time? There will be books available at the event! Andrea! My copy just arrived and it is beautiful! Congratulations on this wonderful achievement. yay!! I’m so happy it arrived. Thanks for the lovely comment. Happy Cooking! It’s been a long time since I’ve anxiously awaited mail…but I am now!!! I soooo look forward to my SIGNED-by-you copy!!! congrats on the cookbook!!! it looks beautiful and this quinoa bowl is definitely something I’ll make for dinner – thanks for sharing! I can’t wait for my copy to arrive! I can’t wait to hold my own copy (I saw lizzy’s) and read every single word. Amazon, get ready for a great review! This dressing is the most wonderful thing! Still licking my bowl.